Need a website for your Local? UnionHall (formerly known as Laborweb) is an easy-to-use solution for creating and maintaining websites. FAST: Locals can build their own website in a few hours. MOBILE-FRIENDLY: it looks good on smart phones. EASY to add content: no technical skills are required. 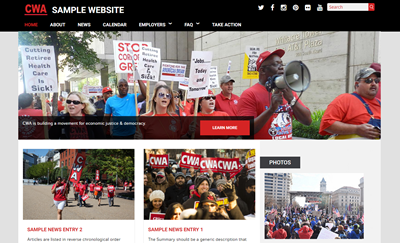 FREE: Hosting, maintenance & upgrades are provided by CWA. SUPPORTED: Phone and email support is provided by CWA. Instructional materials and videos are provided by AFL-CIO and CWA. Sign Up: fill out this form to get started.